SNAFU! : DDG-1000 goes from land attack to anti-surface/anti-air platform...there goes our naval guns AGAIN! DDG-1000 goes from land attack to anti-surface/anti-air platform...there goes our naval guns AGAIN! The Navy has a new vision for what its enormous high-tech destroyers will do: Killing enemy warships at extended ranges. The Navy is asking Congress to fund a conversion of its 600-foot stealth destroyers from primarily a land attack ship to an anti-surface, offensive strike platform, according to budget documents released Feb. 12. 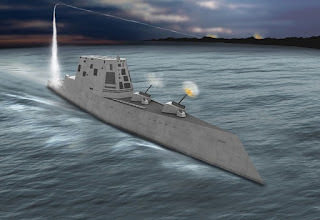 The service’s 2019 budget request includes a request for $89.7 million to transform its Zumwalt-class destroyers by integrating Raytheon’s long-range SM-6 missile, which can dual hat as both an anti-air and anti-surface missile, as well as its Maritime Strike variant of the Tomahawk missile. The SM-6 is a versatile missile that the Navy has been excited about. In August, the Navy shot down a medium-range ballistic missile target with the SM-6, which uses a fragmenting explosion near its target as the kill mechanism. This is different from the SM-3 Block IIA in development that hits its target directly. It can also be used to hit surface targets at sea and on land from hundreds of miles away. And there goes our naval guns...AGAIN! So exactly what will we get with these ships? Supersized Burkes that will be the focus of enemy action due to their large magazine size? I should have seen this coming though. When they didn't make moves to properly equip/fund the cannons that told us everything we needed to know. Never LISTEN to leadership. Always follow the money.